Pruitt-Igoe was a housing development in St. Louis. I say “was” because it was demolished in the 1970s, an icon of urban failure. Its failure is immortalized — in my mind at least — by the section in Koyaanisqatsi depicting slums, urban garbage, and finally the collapse of empty buildings. The Pruitt-Igoe Myth tells a deeper, more detailed story of the housing development. Half a dozen former residents are interviewed in the null white space of old Apple TV commercials. The older ones recall the glory days of moving in to a “poor man’s penthouse” or dancing to music in the hallways with friends. The younger ones remember moving into a building where maintenance and security had become lax, when vacancy and rents had gone up, and when boys had to fight in order not to be bullied and attacked. To get away from the talking heads, director Chad Freidrichs includes some original footage of what the land looks like today — it’s uninhabited, overgrown with grass, weeds, and young trees. The researchers did an excellent job finding footage of Pruitt-Igoe and of St. Louis from the 1940s and ’50s. There are industrial films about families moving from slums to the city. There are films showing happy families moving in to the new high-rise, children playing on the playground equipment in the foreground, with large new sedans in the parking lot. There is grimmer footage from news reports made during Pruitt-Igoe’s decline — reporters standing in front of abandoned buildings, garbage piling up in front of the overworked incinerator, elevators scratched and smelly. Unfortunately, many of the most amazing glimpses from history are repeated again and again, as though the researchers had exhausted the archives and only found so much usable footage. The repetition distracts from the subject at hand and detracts from the power of the footage each time it is used. The subject is the star in The Pruitt-Igoe Myth. It’s not a film to seek out for cinematic or artistic reasons. But architecture and urbanism are hot topics at the movies these days. 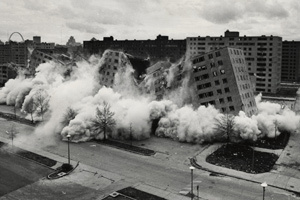 If you came to the Denver Film Center’s series on architecture and film, or if you’re eagerly awaiting Gary Hustwit’s Urbanized, you might choose The Pruitt-Igoe Myth for your personal DFF schedule.